I am your host, Betsy. I, unfortunately, am not Jeff. But fear not! I share his affinity for finding cool interweb doodads — as well as disturbing Amazon products! So, you know the game! Try to make it through this ENTIRE POST without buying something. Don't plan on buying anything? That's okay! Stay for what is — normally — a *classic* Jeff Pun Parade, but is instead this week a big ol' Betsy Goody Bag of Bleak, Fatalistic Non-jokes. Sorry in advance! If you miss Jeff's puns, fill the comments with your own! 1. A set of banana erasers that seem surprisingly joyful, considering what their futures hold. Get a set of two on Amazon for $2.88. 2. A pair of pot pincers for making you the first to win the lobster vs. pot-of-boiling-water game. While you're at it, pick up a skillet to use these on too. Check out our top picks for the best cast iron skillets on BuzzFeed Reviews. 3. A party banner for celebrating wedded bliss. 4. A cactus lamp that emits a warm, desert glow without the sunburn and hallucinating. Get the mini cactus for $15 and the large cactus for $35, both on Trouva. Get it from Society6 for $35+. Available for 16 smart phone models in slim case, tough case, and extra-rugged adventure case. 6. A set of four coasters that are used to all sorts of temperamental moisture conditions. Get East coasters ($31.99) at Domino. Also available in West coasters, North coasters, Gulf coasters, No coasters, and Coast-to-coasters (mixed). 7. A spoon rest that lets your spoon...rest. Get it on Amazon for $12.77. 8. A little sloth planter that holds plants near and dear to his little sloth heart. Get it from FunUsual Suspects on Etsy for $21. 9. A basket that big-spoons your staircase. Get it on Amazon for $32.17. 10. A mushroom night light, or: the cuter of the fungi that can grow on/in walls. Get it on Amazon for $1.79. 11. Decorative washi tape for doughnut-centric DIYs. Get it from Note & Wish on Etsy for $2.57. 12. A plushie bread loaf to support you physically and emotionally after a long day. "Carbs are friends. NOT. FOOD." — Bruce the Shark. Get it on Amazon for $29.80. 13. Catnip French baguettes for cats who say "meow" but mean "Paris is always a good idea." Get them from Mini Tiger Design on Etsy for $10.79. 14. A terra cotta garlic that roasts garlic garlic. 15. A T-shirt for celebrating freedom. Get it on Amazon for $28, or visit Buy Me Brunch. 16. A rib rack. Also for celebrating freedom. Holds up to four racks of scrumptious 'tein. Get it on Amazon for $13.99. You know what else is patriotic? Blenders. Check out our top picks for the best blenders on BuzzFeed Reviews. 17. A motivational office nameplate. 18. 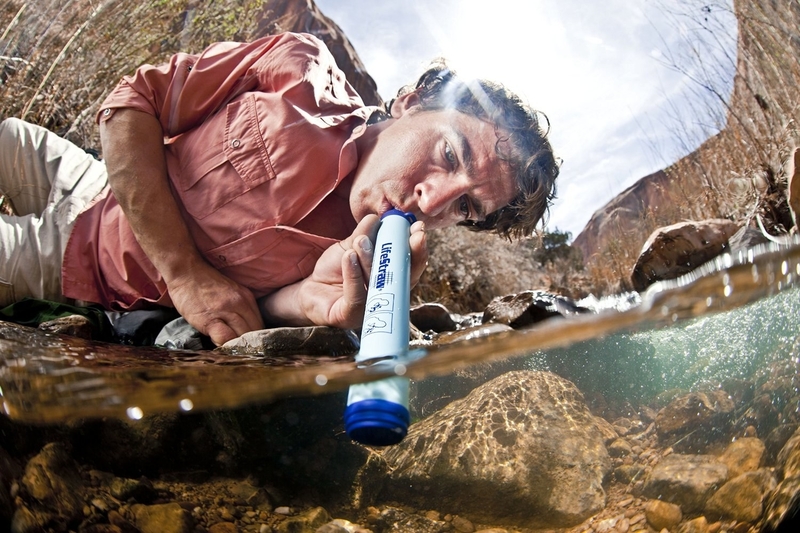 This personal water filtration thing called LifeStraw. Okay no jokes for this one, it's actually pretty remarkable. Get it on Amazon for $12.50. 19. And six-piece Bear Papa screwdriver sets that look like Charmin bears but are far more useful and don't talk about genital lint while I'm trying to eat dinner. Get them on Amazon for $24.99. Available in six colors. RECORD SCREECH. That's it! I hope you enjoyed! If not, soothe yourself with puns from last week's "Can You Get Through" challenge by Jeff himself. Until next time!